Thanks to Miller Ferry for providing our family with ferry tickets and a golf cart rental. Miller Ferry is the MOST inexpensive way to get to Put-in-Bay. Adult tickets (age 12+) are $7.50 and kids 6-11 are only $1.50. As always, all opinions are my own! Traveling with kids can be anything but cheap! 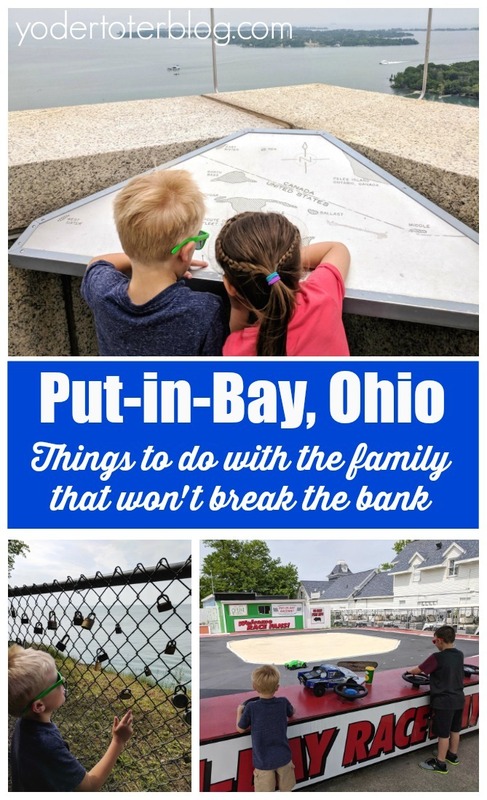 Having a day out at Put-in-Bay with the family is such a joy, but you don’t want to want to feel like your cash is being stretched. 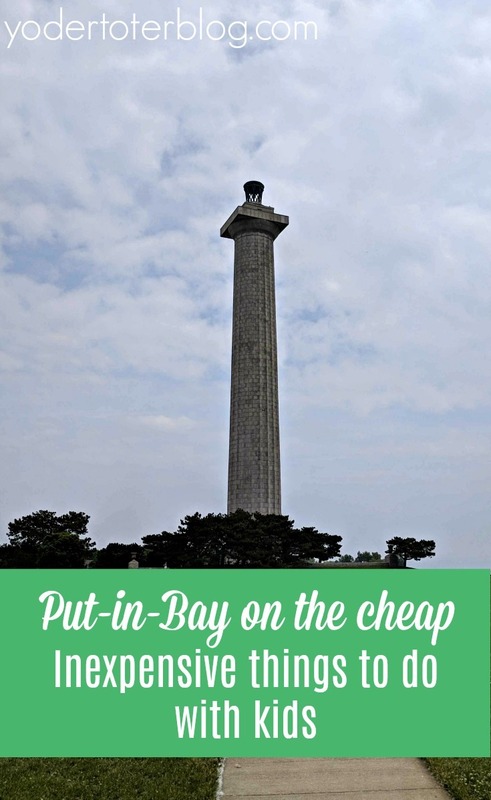 Here’s a list I’ve compiled of inexpensive things to do at Put-in-Bay with kids. Perry’s Victory & International Peace Monument is the most imposing structure on South Bass Island. Constructed in 1936, the monument pays homage to the US victory over the British at the Battle of Lake Erie, during the War of 1812. It’s hard to believe that Put-in-Bay was once the site of a deadly Naval battle. Step away from your family fun to consider what that day may have looked like. 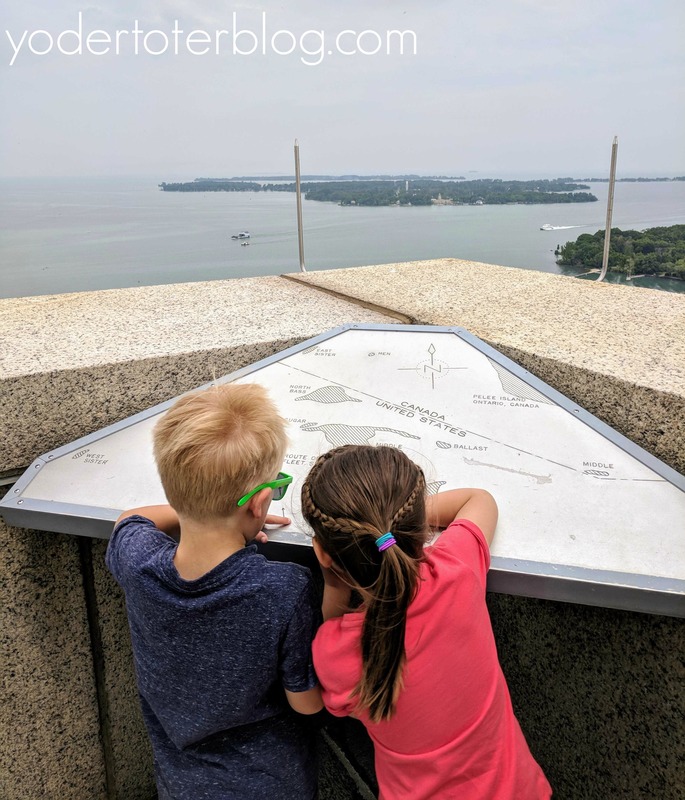 The Observation Deck is the perfect place for the family to get an idea of where Oliver Perry made famous the phrase, “Don’t give up the ship!” Five miles away is our now ally, Canada. Admission to the Observation Deck is FREE for kids under 15. Adult tickets are $7. The Lake Erie Nature and Wildlife Center is the place for kids (and adults) to learn more about local and national wildlife. There is also an on-site nature trail. Looking for educational programming? Wild Tuesdays happen each Tuesday during summer break and feature a science topic for kids to explore in-depth. The cost for a family is only $8. 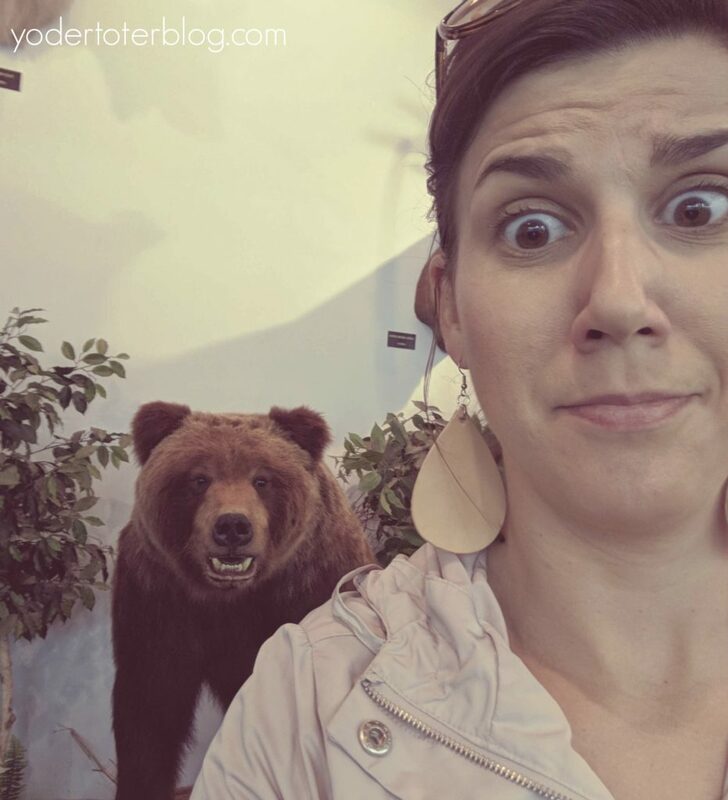 Instagram-worthy photos with Mr. Bear are included with admission. South Bass Island is home to two state parks – South Bass Island State Park and Oak Point State Park. South Bass Island State Park offers camping and boating rentals, but our kids enjoyed a quick stop to throw some rocks in the water. On a warm day, this would be a great spot to let little ones dip their toes in and cool off (Note: the beach is very rocky). Ohio’s State Parks are FREE. Just park your golf cart and enjoy. 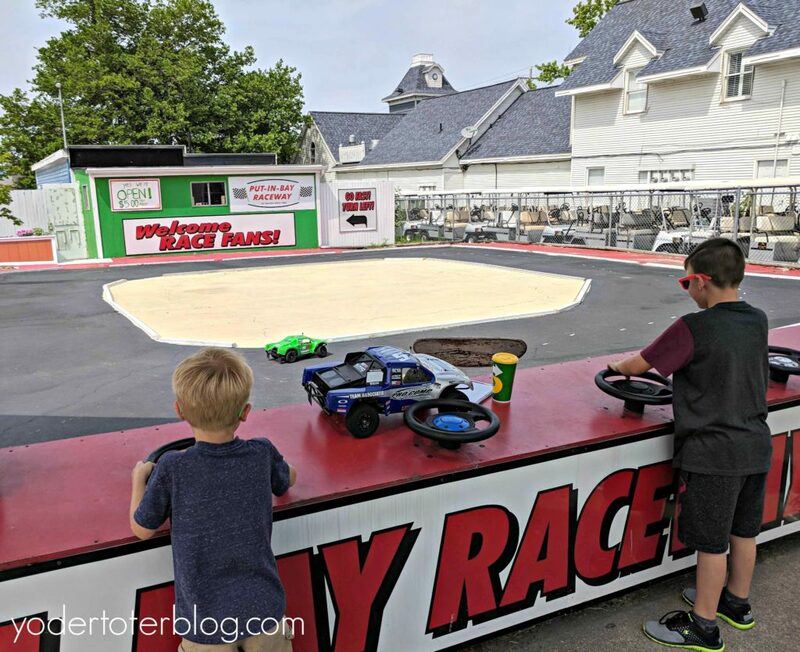 Our kids are still a bit young for Go-Carts, so instead, we allowed them to race a remote-controlled car at the Put-in-Bay Raceway. This stop is located on Delaware Ave., right in downtown Put-in-Bay. The boys felt like NASCAR drivers, while mom worried about the cost of future car insurance policies. Cost for this activity is $5/person. My secret to traveling with kids in the summer? Always bribe with ice cream. Repeat after me, “If you are good and do ______, I will get you ice cream.” My husband also uses this with me. Ice cream is a universal bribery. Yes, ice cream is life. So (I digress), belly-up to the PIB Candy Bar and pick your favorite flavor of Toft’s Dairy ice cream. Toft’s is made just across the road lake in Sandusky, Ohio. Maybe you can even visit Toft’s when you return to the mainland! Ask for a kid’s sized cup- $2/each. 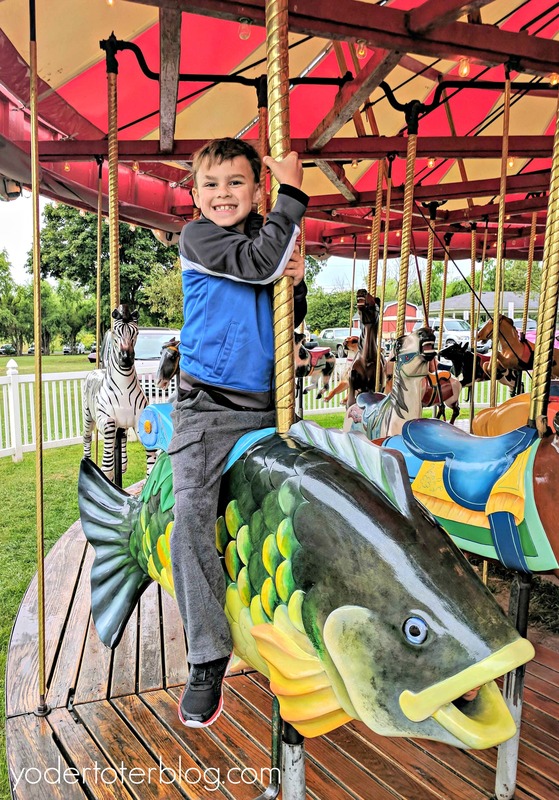 Kimberly’s Carousel is one of the oldest Carousels in the USA. Built in 1917, a spin on this nostalgic Carousel is fun for young and old. Pay attention to the eclectic cast of characters as you spin around and around- Petey the Perch is one of the most beloved. Rides are $3/pp – making this another inexpensive thing to do at Put-in-Bay. On our last visit to Put-in-Bay, we set off to explore more of the island and just happened upon Captain Alfred Parker Park. The small local park is located on the Northeast side of Put-in-Bay and has an obstructed view of the Benson Ford Shiphouse. 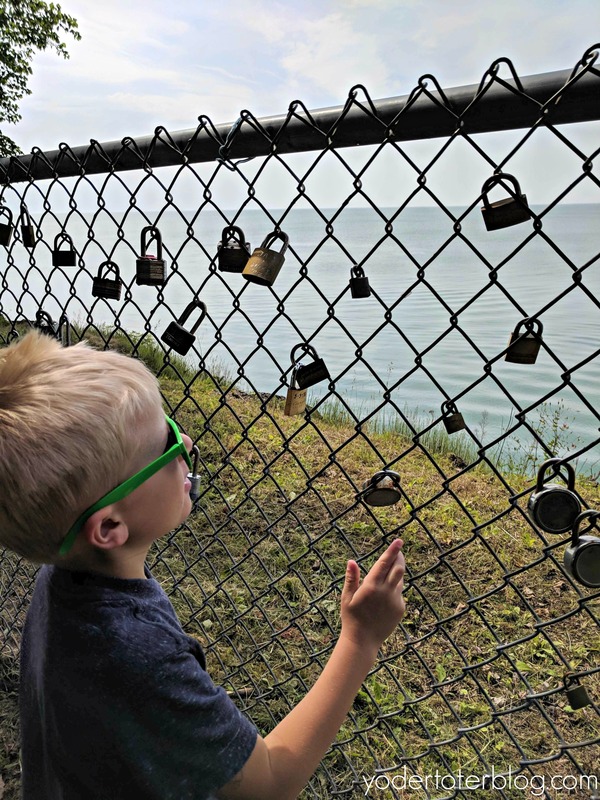 Not only would this be the perfect place to catch a sunset, you can “lock in” your bond to each other, AND Put-in-Bay, by placing a lock on the fence. While padlocks are used to symbolize romantic love, I like the idea of using them to show family commitment, too! Disclaimer: I don’t know if this is legal or not?! Add a lock at your own risk! Need more ideas for Put-in-Bay? Check HERE. Have you been to Put-in-Bay? What’s your favorite thing to do?